Welcome to Listening Party, a boutique imprint out of Milwaukee, Wisconsin that specializes in high quality, limited edition vinyl releases and pay-what-you-like downloads. 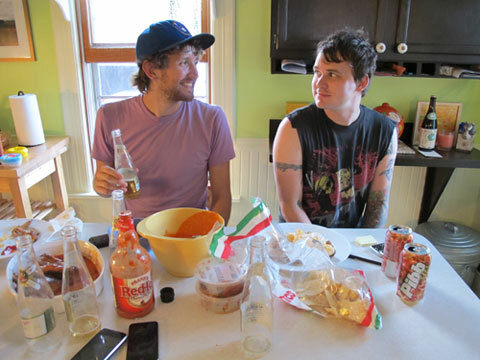 Listening Party is run by us: Andy Menchal and Nicholas Sanborn in scenic Milwaukee, Wisconsin. Both of us are musicians and record nerds, and we're very devoted to our artists, the records they release, and the people who listen to them. For the collectors, we produce high quality vinyl in hand-numbered editions of 500 with individually silkscreened artwork. For the more casual listener, we offer every record we release in multiple high-end formats (320kbps mp3, FLAC, etc) as a pay-what-you-like download because we want everyone to have access to great music. Besides records, we also enjoy fantasy football.